The Boston Terrier was developed in the United States and its ancestors were British Bulldogs and English White Terriers, but these breeds were considerably different from those we know today. Blessed with heaps of personality Boston Terriers usually live up to 14 years of age, but given plenty of praise and attention and the proper nutrition will easily live to 16 years. A healthy female is normally 6.8kg and 30cm tall, while a male in peak condition is 12kg and is up to 45cm tall. 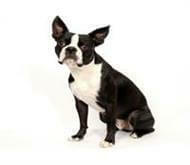 Boston Terriers are lively, highly intelligent little characters, noted for their loving, affectionate personality. This is characterised by extreme devotion to family and friends, children, and other pets. The dog's bearing should convey an impression of determination, strength and activity. Symmetry, beauty, style and elegance are all hallmarks of this diminutive, but highly distinctive breed. In particular, the Boston's large dark, expressive eyes contribute to its characteristic and captivating demeanour. Boston Terriers are fastidiously clean and quiet to have around the house. As Boston Terriers tend to be naturally spotless and bear no doggy odour, they require no more than the barest minimum of grooming in order to maintain their sparkling appearance. The Boston Terrier makes an ideal dog for those with limited room.